Eagle Rock Easy Low Water Plants [with VIDEO] -- Linda Vista Landscape Services, Inc.
For this Eagle Rock, California residence, the client had the original landscape of a row of bushes and grass. There was no color in the landscape, and she wanted the grass removed with a conversion to drip-water irrigation and easy low water plants. Here’s the step by step and also a video of the finished product at the end. The grass was a mix of Bermuda, St. Augustine, and other grass blends with significant thatch (layers of living and dead grass that are very thick and impede the health of the overall lawn — this occurs naturally if the lawn is not periodically dethatched). The sprinkler heads were deep into the thatch, which was unslightly. Not to mention the high water use to attempt to keep the grass green was put under water restrictions due to mandatory California drought water conservation rules. The client also wanted the boulders to be reused in the new landscape. The landscape was also on a slope, which complicated the grass watering because there was always water run-off. Installing drip irrigation in a drought tolerant landscape would be better overall and should also prevent irrigation water loss and promote water savings. The first step was to remove the grass and thatch by hand. Rototiller removal does not do the job because there needs to be a clean sweep of lifting and removing the grass debris to a 6-8 inch depth while also gathering as much of the root system as possible to try to prevent grass resurfacing. The grass is then hauled away and disposed of in a green landfill or compost facility. With the grass removed, we divided up the rectangle-shaped lawn area into beautifully curved planters with easy low water plants and succulents. Adding curves to otherwise boxy landscape creates a more tranquil environment and is more interesting to the eye. Here’s another view of the curved aspect of the planters. 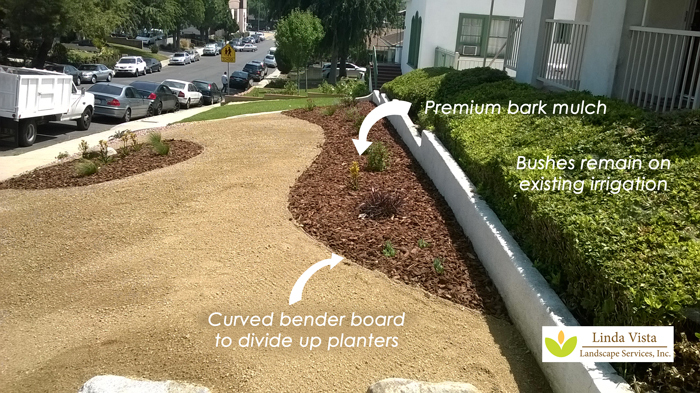 Premium bark mulch was used to fill in the planters that were contained with curved bender board. The bushes remained and are to be maintained with the existing irrigation. All the plants in the new front landscape were put on drip irrigation, saving the client money and also preventing water loss and run-off. The boulders were recycled and reused in strategic areas of the front yard. In this geometric, custom-curb-appeal center planter, you see drought tolerant Kangaroo Paw, Senecio, and Stipa Grass. In the background planter, there is Sage and Fountain Grass. Lots of color and variety in the plants as they grow and fill up the planters. As you can see, there is plenty of spacing between the young plants so that the planters won’t be too crowded as the plants grow into maturity. 3/4 inch decorative pink rock was placed in the corner planters to add variety and curb appeal. The brown filler that you see is decomposed granite. In the corner planters, they were filled with colorful and varied Lantana, Agave, and Senecio plants. Here is a reverse view of the top planter. The plants in the top planter are purposely going to grow a little taller than the bottom planters, for a tiered look. And, another view of the corner curb appeal. You can see some of the new Lantana color peaking through. The final project is virtually no maintenance for the homeowner, with a clean and colorful look. The curved lines hold attention. No more grass mowing! The variety of plants and color create beauty, as well as flowering plants for pollinators. And the water conservation benefits are huge.